You have to concede that the majority of online Thai resort sites now feature a section on “Weddings”, with a young glamorous couple taking their vows against a Beautiful backdrop of white sands and blue waters plus a palm tree or two for good measure. Where the couple shown getting married in these photos is actually located might actually be anywhere in the world, might not be immediately apparent unless the location is stated under the image! Even then it is a photo meant to sell you a dream wedding location…maybe not reality. How to be a good online consumer. Ask questions assume nothing is as it might appear. Double check. My favourite question I have heard is asked is, “Why come to Thailand if you want to wed exactly like back home?” OK, the TAT (Thailand Authority of tourism) says it is cheaper here, but I hope it is more than that. So why not have an authentic Thai wedding, I guess that would mean no beach wedding. OK, so you might have your heart set on the western Beach wedding so let us look further into beach weddings in Thailand. If the sites wedding photos has few distinctive locations shoots with a bridal couple maybe you should wonder is it actually shoot at the resort? If all the photos show only one couple was it just a sales Dept mock-up wedding? Have they actually done a wedding before? These are both big warning signs. Find out more. Ask for references local to you if possible..
Do they actually have a suitable beach yes I have seen resorts advertise beach weddings and if you investigate they have no vast open beach area but a beautiful rocky shoreline with several very small sand patches and a long pier? So all weddings held on the small lawn area or by the pool. Ask and get detailed answers. Do they have an experienced wedding planner or is it just a resort salesperson? You must accept that you are just one of perhaps hundreds of guests at the resort, so the resort must not disturb them to make your day perfect. If you want it to be all about you then a private island and book the whole thing might be the perfect answer if your budget is big enough. Even in Thailand that is not so cheap. Not every Beach or island location has ministers available. Celebrant does not mean minister! I know of a 5-star resort who just avoided the question of is the celebrant a minister and the couple spent the few days before their wedding frantically searching for a real minister to perform the marriage when they found out the celebrant was nothing more than the western general manager of the hotel. Remember ministers are rare in Thailand and fewer still will do a wedding at resorts. Ask and get a proper detailed answer. True professionals not just a young person with a fancy camera. So ask how experienced is the photographer. Does he or she work for other resorts? Have they done western weddings before do they speak some English? I am not saying Thai photographer are less qualified than westerner ones but every photographer has a personal style and asking to see an on line gallery of their work is just a wise. Many resorts and planners try to up-sell you on western photographers so they get more commissions. They expect the same or more than they get back home so be careful there are some excellent Thai and western photographers in Thailand. You want your beach wedding is the weather suitable for a beach wedding it is not only rain you must consider but winds. Yes, winds are often seasonal as well and gusting wind blowing sand into your face and everywhere does not lead to a great wedding experience for sure unforgettable wedding but for the wrong reasons. Plan your wedding at the best time for the day so the beach area is not to crowded. 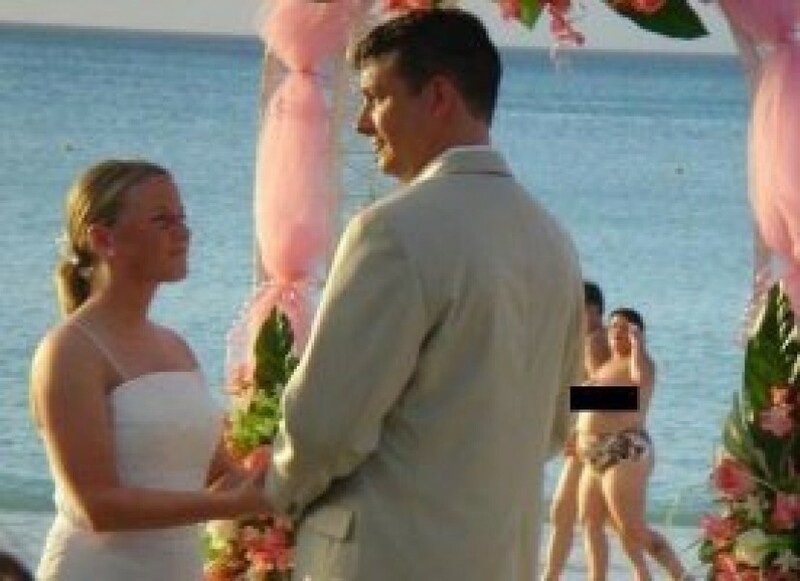 Yes what is the point of a lovely wedding surrounded by a half naked obese people in bikinis and thongs and is amazing how they ruin your photos when they are in the frame. These are just he tip of the iceberg of questions and answers you need to know before you book your perfect beach wedding. Remember in spite the fear of booking your wedding over the internet it can and probably will be a great choice with a little common sense and bit of careful research.